SheepSkyr is our Icelandic-style yogurt inspired cheese. 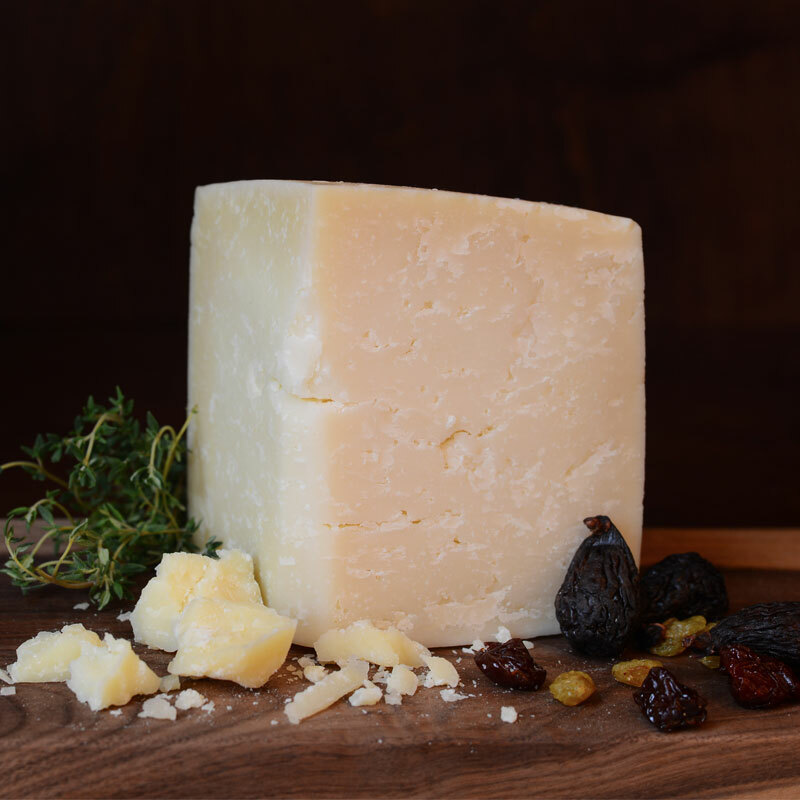 It is a gorgeous treat with full, bright acidity and natural grassy notes from the whole sheep’s milk we use in it. The texture is silky and luscious, not airy like other products made with fillers. Our Skyr is simple: milk, Bulgarian yogurt cultures, and rennet. We gently pasteurize the milk and use a long, low temperature incubation which produces that lovely texture that goes perfectly with granola and jam or on the savory side, grilled meats and vegetables. 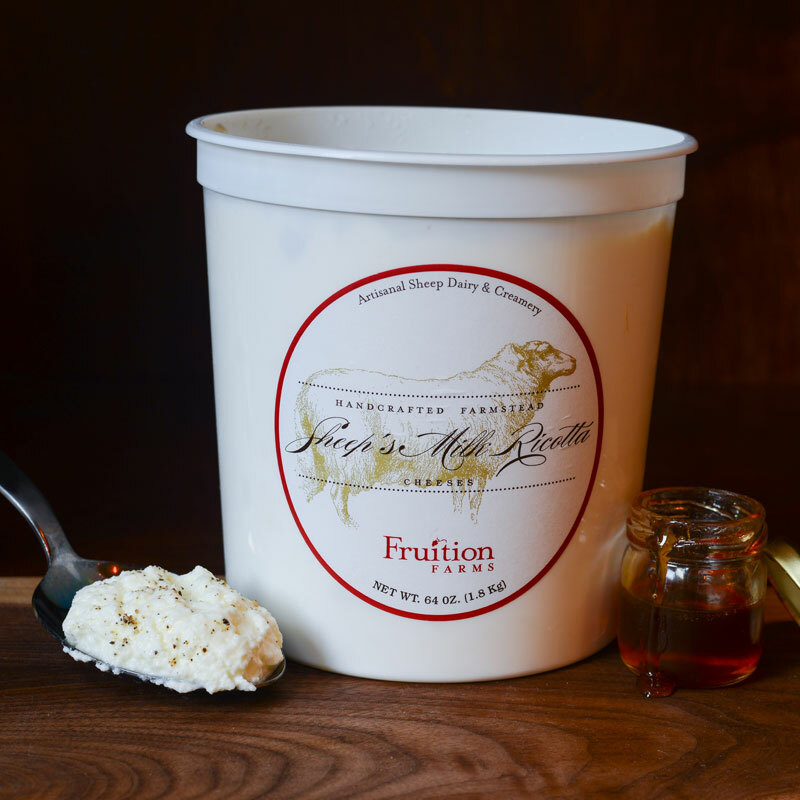 Fruition Farms Creamery’s ricotta was our first cheese. Jimmy and Alex made ricotta as chefs and enjoyed working their recipe until they ended up with what has become an integral part of the Fruition Farms Creamery portfolio. It has a fluffy, large, soft curd that will have you thinking of spring lambs and pasture grass when you taste it. Our favorite ways to pair our ricotta (that is, when we aren’t just taking a spoon to it) is with a little house-made jam, stone fruits or honey on the sweet side. With savory pairings, it is excellent in pasta or on freshly baked breads like focaccia. The process Jimmy uses in making the ricotta is to start with whole sheep’s milk and gently pasteurize it at a low temperature. As one of our fresh cheeses, it is a salt & citric acid started cheese (no rennet in this one) that ships right after we make it. The creative start to this one began with a couple chefs, a 10-quart stock pot and a “wine cooler cave.” Cacio Pecora’s make has evolved into the use of a 100 gallon make tank and 600 square feet of temperature and humidity-controlled caves where it ages in ideal conditions for up to 18 months. Don’t you love it when chef’s play? This two-day brined, raw milk cheese has a lot of goodness going on with nutty, floral and grassy notes. It has a beautiful, smooth natural rind and is fantastic in risotto, pasta, eggs and fondue. We also like it over salads and potatoes or encrusted onto poultry and meat. Each day, a portion of the morning’s milk was taken to enrich a cup of coffee, bowl of cereal or simply enjoyed on its own. The so-called “Shepherd’s Share” is what was used to make our Shepherd’s Halo cheese. We make it by adding a special recipe of cultures and some rennet to the whole sheep’s milk after gently pasteurizing. The Halo wheels get a light 4-hour brining and are aged for 21 days. The resulting texture is angelic. Its bloomy white rind envelopes a silky, buttery halo of a cream line and a firm, creamy paste center. It is both salty and sweet with mild acidity. Don’t think this graceful cheese withers against sturdy pairings. It goes beautifully with chutneys or preserves and is both wine and beer friendly. For the full texture experience, enjoy this one on your cheese plate with nuts and crackers for a bit of contrasting crunch. We love it spread on a crusty baguette with nice ham. Our latest love child is our feta. It is smooth and breakable but not mushy or wet. It has perfectly balanced acidity, gentle saltiness and a slightly nutty background. Like several of our other cheeses, we lightly pasteurize so that the excellent whole sheep’s milk flavor can still shine through. We brine our feta in the whey that comes off of it during the make, which gives it a fuller flavor. It’s a perfect match for summer tomatoes and melons, crumbled over salads, or on top of roasted or grilled foods.